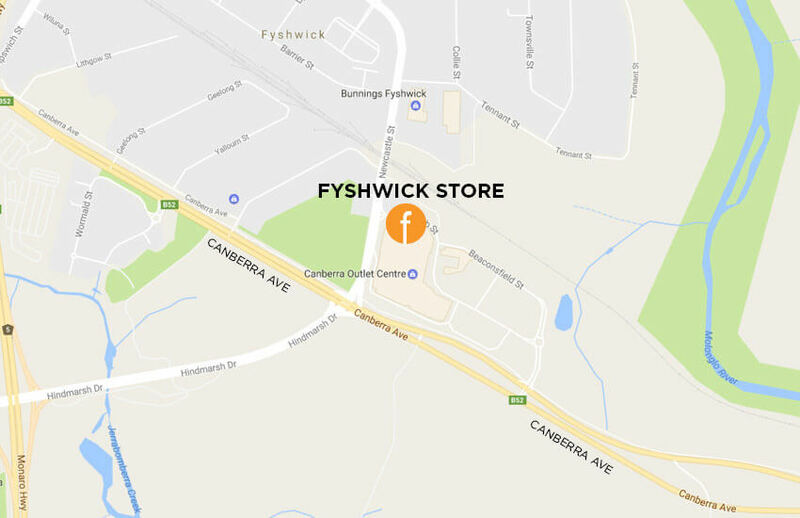 If you have some time to spare to shop for furniture in Canberra, look no further than the Focus on Furniture store located inside the Canberra Outlet Centre in Fyshwick. The Canberra Outlet Centre is home to all of the top retail brand stores as well as restaurants and cafes, and our Focus on Furniture store is located right in the middle of it all. You can extend your furniture-shopping excursion to a day spent weaving in and out of the shops in between visiting cafes and restaurants. Canberra Outlet Centre is an outlet store and discount shopping centre that serves as a hub for many of Australia’s top fashion and home goods stores, making it the prime location for our Focus on Furniture location in Canberra. They have the top stores in ladies’ and men’s fashion as well as children’s and footwear. There are also stores for fashion accessories like jewelry, luggage and handbags as well as sporting goods stores and general retail like specialty stores, arts & crafts and haberdashery. All of these on top of the many restaurants they also have on site. At our Focus on Furniture in the Canberra Outlet Centre, you will find the best and the latest in our range of lounges, bedroom suites, dining sets, occasional pieces, mattresses and clearance items. You will find that Focus on Furniture is one of the finest furniture stores in all of Canberra with our wide range of furniture for every room in the house that needs dressing up. We chose the Canberra Outlet Centre to house our Focus on Furniture store as it serves as the primary location for our furniture stores in Canberra for customers who live in and around that area. The locale itself thrives with a lot of other types of stores as well as eateries so you can make a trip to the furniture market an errand run as well! Stock up on other home goods as well as clothing and footwear and other household commodities! Our store here in the outlet centre features an expansive showroom that tastefully displays how our furniture pieces are best styled and how they can complement a room with their own presence and design. You will be able to then see how each item of furniture or each suite is able to elevate a room’s appeal and make any home look more complete. Focus on Furniture does just that. We focus on manufacturing top quality, low cost furniture to fill your homes with. We have lounges – whether you’re in the market for a leather or fabric lounge, or if you’re looking for something that’s proudly Australian-made, we will have the perfect option for you. We also have top quality bedroom furniture for you or your kids as well as for your guest or spare room. We also offer dining suites ranging from 3 to 5 to 9 piece variants, as well as the grander 11 piece options. For the bedroom, we have suites, where furniture sets can be purchased. These suites include bed frames, chests of drawers, tallboys and closets, so you won’t have to find separate pieces to tie up to a theme you’re going for. We already have a load of suites for you to choose from! For the living room, we offer furniture that will tie together a specific look in the right finish and color that you are trying to achieve. You just need to select a suite that suits your taste and we’ll have your living room furnished and styled for you! If you’re going for a statelier piece of furniture, head on over to our Platinum Range where things are more luxurious, stylish and grand than your standard, everyday chair or lounge. We have ottomans, tables and chaise to dress up your room! We have taken every measure to ensure that our Canberra Outlet Centre Focus on Furniture store has all of the same pieces of furniture available on our website, with the added bonus of our helpful and well-trained staff who will answer all of your queries on site as well as show you all of the features and benefits of purchasing any particular piece of furniture that may catch your eye while you’re there. Take advantage of the face-to-face time that you have with our staff and inquire as much as you like so you can be sure to take home the best addition to any room in your house. When you shop at our store at the Canberra Outlet Centre, you have the added option to make the most of our “No deposit, 5 years interest-free” promotion with a minimum spend of $2300. Since terms and conditions apply, you may also inquire with our in-store staff! Other special promotions may also be available in store. Our other finance options are here. It’s not just the location – which is as prime and ideal as they come – but the store as well. We’ve packed our Canberra Outlet Centre Focus on Furniture full of our top-of-the-line furniture pieces to impress you and only offer you the best. Head on over to the Canberra Outlet Centre today and pop into Focus on Furniture where you will not only find the best and the latest in home furnishings in all of Canberra, but also offer the best in-store deals and service with the most accommodating and knowledgeable staff.